College Football is Back! ESPN Welcomes the Sport’s Return with Multi-Platform Media Days Coverage and Nick Saban, Dabo Swinney in Bristol, Conn. - ESPN Press Room U.S.
College Football is Back! ESPN Welcomes the Sport’s Return with Multi-Platform Media Days Coverage and Nick Saban, Dabo Swinney in Bristol, Conn.
ESPN will begin its 2018 season-long college football campaign in earnest with multi-platform coverage of conference kickoff events and media days, the return of College Football Live and national championship-winning coaches Dabo Swinney and Nick Saban coming to its Bristol, Conn., campus. College Football Live will make its return on Monday, July 16, airing its season-debut live from the College Football Hall of Fame and SEC Kickoff at 6:30 p.m. ET (ESPN2). The 30-minute show will continue throughout the month, airing at its normal, season-long timeslot of 3:30 p.m. most days and 5 p.m. on other days. In July and the season, the program will regularly air on ESPN2. In addition to airing from SEC Media Days during its return week (July 16-20), the show will be live from Pac-12 Media Day on Wednesday, July 25 (3:30 p.m.). ESPN’s networks will bring fans to 11 media days, including ESPNU and ACC Network Extra programming at ACC Football Kickoff (July 18-19), SEC Network coverage at SEC Kickoff (July 15-19), ESPNU and Longhorn Network at Big 12 Media Days (July 16-17), and ESPNU at Pac-12 Media Day (July 25). ESPN3 streams live specials from the American (July 23-24), Conference USA (July 19), MAC (July 24), Sun Belt (July 23), Big South (July 24), Northeast (July 24), Southland (July 19) media days. ESPN.com will have nearly a dozen writers covering the various media days. 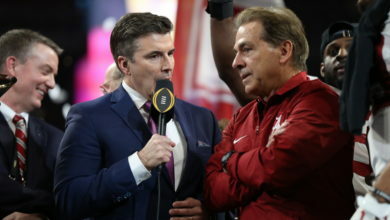 ESPN will host Clemson’s Dabo Swinney (July 23) and Alabama’s Nick Saban (July 24) at its Bristol, Conn., headquarters with the two coaches appearing across numerous ESPN shows and platforms throughout the day. A more detailed schedule of their appearances will be determined as the date approaches. Starting this summer, ESPN+ will house classic college football games available on demand, including the top games from last season. Beginning July 16, ESPNU will re-air the best games from the 2017 college football season at 7 p.m. and 10 p.m. ET most nights, concluding with last year’s top two games on Thursday, July 26.